PHOENIX — Up for a challenge? 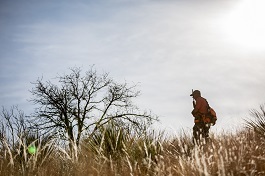 The Arizona Game and Fish Department still is accepting registration for hunters to participate in the Arizona Small Game Challenge, a new concept created in partnership with the Valley of the Sun Chapter of Quail Forever that highlights the state’s abundance of small game hunting opportunities. “With the start of the general hunting seasons right around the corner, this is a great time — and a fun way — for all hunters to get out and experience the rewards associated with small game hunting while enjoying the vast beauty of this state,” said Wade Zarlingo, the department’s small game program manager. A logical progression toward completing all four individual challenges might be to start with the Desert Challenge. A hunter only needs five of seven desert species to complete the challenge, and three of those species are doves — mourning, white-winged and Eurasian collared. With the start of the dove season Saturday (Sept. 1), hunters can take a big step toward finishing off that first challenge. A hunter must be registered at the time of harvest and the completion of the challenge. All small game species must be harvested during the general season. Game birds must be “wild” birds, not those raised in captivity and released. Registration is valid Aug. 1 through July 31. Registration is limited to 300 participants. Dove: Sept. 1-Sept. 15, 2018 (mourning, white-winged, Eurasian collared), Nov. 23, 2018-Jan. 6, 2019 (mourning, Eurasian collared), Sept. 1, 2018-Aug. 31, 2019 (Eurasian collared). Quail: Oct. 19, 2018-Feb. 10, 2019 (Gambel’s, scaled); Dec. 7, 2018-Feb. 10, 2019 (Mearns’). Cottontail rabbit: July 1, 2018-June 30, 2019. Dusky (blue) grouse: Sept. 1-Nov. 11, 2018. Chukar: Sept. 1, 2018-Feb. 10, 2019. Band-tailed pigeon: Oct. 5-18, 2018. Tree squirrel: Oct. 5-Dec. 31, 2018 (Abert’s, Kaibab, Red). Need a license? Then consider buying more than just an individual hunting license. Go online and purchase a combo hunt and fish license that will be valid for the next 365 days – and for only $20 more (for state residents) than the price of an individual hunting or fishing license. Visit https://www.azgfd.com/bestofbothworlds/ to get a combo hunt and fish license today. As a reminder, a youth combo hunt and fish license (ages 10 to 17) remains $5.